While the mainstream media largely dominate the discourse and narrative of the daily news cycle, we have, since the dawning of the Web some twenty-five years ago, seen this tight grip of control loosening at an increasing rate. The emergence of citizen-journalism via the blogosphere in the early 2000s, followed by the explosive and ubiquitous presence of social media in the late 2000s, has empowered the individual in the act of distributing their own view of events as they unfold: anyone with a mobile device is transformed into a broadcaster exposing an inside glimpse of the world and its crises as never before. Arab Spring and other recent revolutionary movements have taken their cue from independent journalism via the global networks. The key question raised here is the following: how might the artist engage rogue tactics of journalism via the Internet to directly challenge the dominance and status quo of the broadcast media? 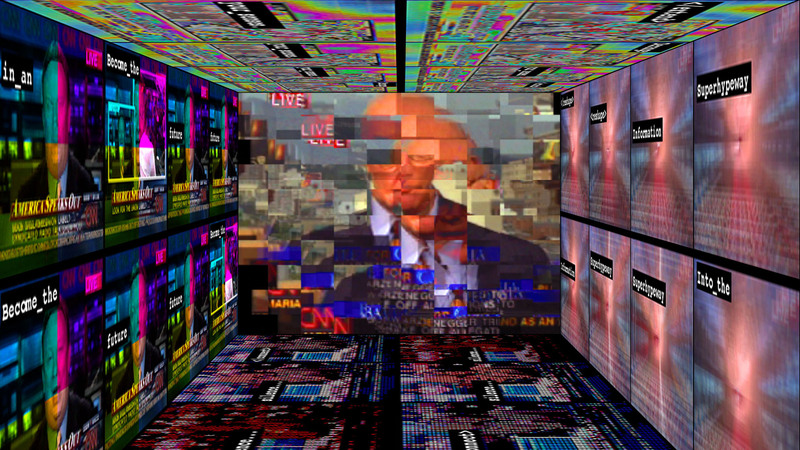 If we consider Gene Youngblood’s critique of the broadcast as a source of ‘contamination,’ in which the media consciously manipulate the news in order to alter our sense of reality, perception, and judgment – thus reshaping the narrative of political and social events – how might the artist disrupt the broadcast with a critical and aesthetic response that attempts to undermine the effects of contamination and manipulation of our individual and collective view of the world. For the past 15 years, through networked art projects that include the US Department of Art & Technology (2001-2005), Media Deconstruction Kit (2003-2004), and The Post Reality Show (2012-), I have used techniques of media to appropriate, transform, and rebroadcast live cable news media via the Internet to amplify and distorts its contents: allowing us to view the broadcast in a new way, revealing its hidden mechanisms of control, a détournement that jolts us out of the sensationalism of media and its seductive hold on our gaze. In contrast to the citizen journalist who brings unreported events to the light of day, the artist’s reportage here takes shape as a disruption of the media broadcast, attempting to expose its effects of disinformation by shocking the viewer out of obedient assimilation of its contamination.